While the notion of having fresh produce or pre-prepared nosh delivered to your door is nothing new - it's been happening for decades in Australia - there are now a raft of companies that have taken things up a notch - from sourcing artisanal ingredients to doing your weekly shop for you and telling you what to cook and how to cook it. While I will always prefer the experience of mooching around a market and sourcing ingredients for myself, there are times in my life when finding food parcels on my doorstep feels like manna from heaven. Here are four home-delivery services I put to the test to help me get over those hump days. 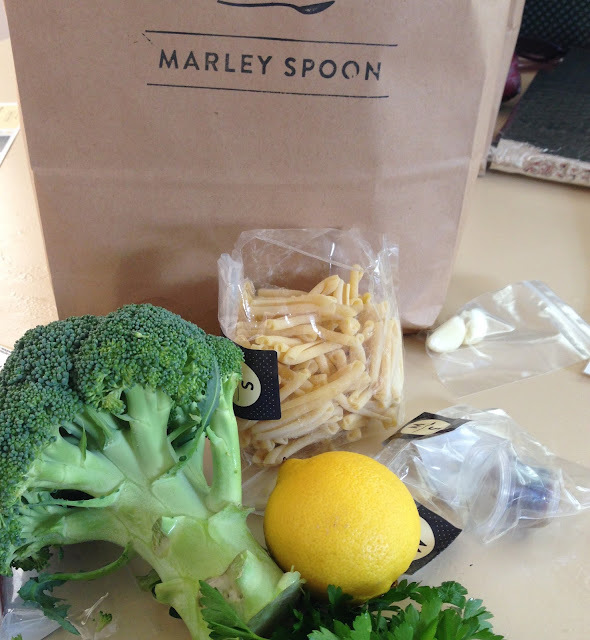 Marley Spoon spoon-feeds you every step of the way with recipe cards and ingredients ready to go. The new kid on the gourmet home cooking service block is Marley Spoon, which has upped the ante by bringing a roster of celebrity cooks and chefs to the table to share their easy-to-prepare dishes. It's like someone has flicked through your favourite cookbooks and plucked out the best fuss-free recipes from chefs such as Michael Rantissi of Kepos Street Kitchen to Luke Nguyen, of Red Lantern. Each guest chef brings their own unique flavour to the menu, with Rantissi sharing his take on roast spatchcock with spiced lamb and pine nut stuffing and Everyday Gourmet's Justine Schofield sharing favourites such as the speck, porcini and pine nut pasta. The ingredients arrive in brown paper bags with 6-step illustrated recipe cards. There is even a cooking hotline for home 'kooks'. BEST FOR: Cashed-up 20-somethings who want to take the guesswork out of dinner and time-poor cooks who want to be inspired in the kitchen. HANDY HINT: Most of these dishes can be made in one pan and whipped up on a weeknight in as little as 30 minutes. There are lots of reasons to love receiving your delivery of dish'd. Firstly, if you're going to get food delivered, then you want some of the hard work done for you. As well as offering free delivery on orders over $80, there are more than 200 dishes to choose from on the site. After 18 years of running his own restaurant, French chef Jacques Reymond has curated the dish'd menu, which includes dishes such as prawns en papillote with zucchini, edamame beans and lemon crème, green beans, romanesco, cauliflower and broccoli and potato Dauphinois with cheese. Never thought I'd be a fan of pulling food out of the freezer, but there was a great range to choose from and a few nights where dish'd saved my bacon. Fake it until you make it with one of Reymond's French tarts such as raspberry and pistachio frangipane tart with butter shortcrust pasty. Superb! BEST FOR: Busy couples with dual incomes or single 20-somethings who enjoy chef-inspired dishes but don't know their way around the kitchen. HANDY HINT: If, like me, you don't own a microwave, simply adapt recipes and use your stovetop to heat up your dinner instead. Oh and repurpose any single-use containers to hold herbs, nuts or seeds. 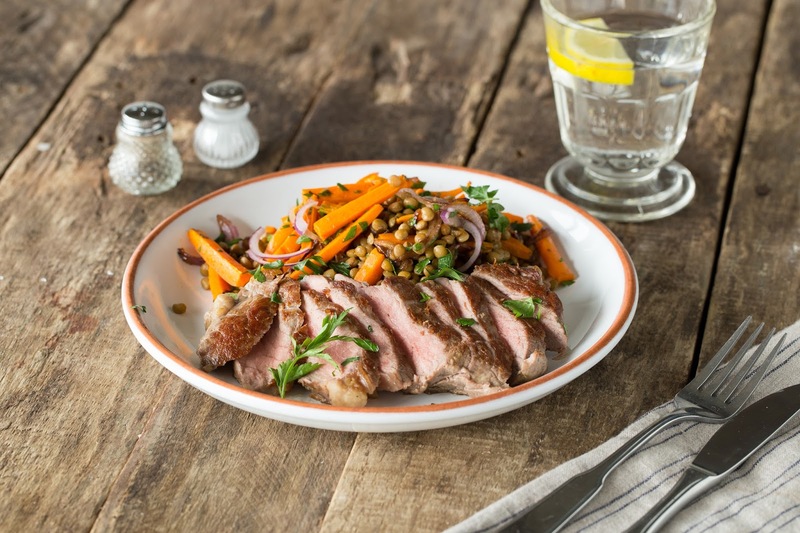 Steak and lentil delight from the HelloFresh range of recipes. Image: Supplied. Despite being a passionate cook, I'm often so busy during my working week that I feel like I'm preparing food from a bunker. HelloFresh took me by surprise in that it told me what to cook and shoehorned me out of my food rut. The delivery service arrives with recipe kits and a box full of fresh ingredients portioned out so I could plan my weekly cook-off. I loved being bossed about so I could just focus on the meditative act of chopping, stirring, searing and serving. I also love that by delivering the exact quantity of ingredients I needed for my weekly meals, there was no food waste whatsoever. Family favourites from the 'healthy' range included the harissa chicken with smashed chickpeas, cherry tomato, olive and goat curd penne and chicken soba noodle soup. BEST FOR: Working parents who want to expand their cooking repertoire with ease and takeaway addicts who are hungry for inspiration. HANDY HINT: New customers are invited to take the HelloFresh challenge by claiming back the cost of their takeaway dinner to the value of $40 so they can put HelloFresh to the test. My Food Bag sources quality ingredients and tells you what to cook and how to cook it. Dinner can also be delivered to your doorstep courtesy of My Food Bag, which offers four different food bags to choose from. The first food bag comes with a recipe folder that you can fill with meal ideas from the Classic Food Bag (which feeds two adults and two teenagers or four adults), Family Food Bag (which feeds two adults and 2-3 young children), Gourmet Food Bag (for cashed-up couples) or My Own Feed Bag (for busy singles). The service has teamed up with celebrity chef Miguel Maestre to help Australian householders find their mojo when it comes to making healthy home-cooked dinners. The recipes were also created in consultation with food nutritionist Nadia Lim so are beautifully balanced and nutritious, too. Hits in our household included teriyaki salmon with brown rice and edamame and radish salad as well as pistachio-crusted lamb with red cabbage, kumara and beetroot relish. BEST FOR: Those who are too busy to do a weekly shop and want to avoid takeaway. HANDY HINT: Despite the Family Bag being portioned out to feed two adults and two children, we found that we always had leftovers for lunch the next day. If you are struggling at the end of a working week, My Food Bag will help you through Hump Day.